The most poignant part of the lessons for me is when Ezekiel takes his foot off the gas in the middle of the reading to remind his audience: “As I live, declares the Lord GOD, I have no pleasure in the death of the wicked, but that the wicked should turn from his way and live, turn back from your evil ways, for why will you die, O house of Israel?” (Ez 33:11) Who is the “house of Israel” that God is talking to? … Yes, us, we are Israel. Jesus is Israel, we are in Jesus, even 500 years before Jesus, God, through Ezekiel, is talking to us and almost pleading with us. I don’t want to see people die in their sins, I don’t want to see people lost in Hell for eternity, that is horrible, I want you to fear me enough, to know who I am, what I have done for you and for you to stop resisting and find peace and rest in My grace. God is often practically pleading with us, stop it, get over this ridiculous, rebellious, attitude that only leads to death! We should be in a state of reflection, repentance and prayer all year long, but we have been given this time of Lent to specifically reflect on the reality of the state of our sinful nature. Not as a way to beat you down, but as a way for you to truly live “I am the way the truth and the life…” Jesus tells us. His way, life and life more abundant in the resurrection. The world’s way is sin and death. We may think Ezekiel is being overly harsh, but God, through Ezekiel, is desperately trying to steer us away from our rebellious and sinful nature and find true life, hope, promise and eternal life of perfection in Him. Is there any doubt that when someone repents, stops his rebellious ways that the Father will be joyful? Luke writes: “ESV Luke 15:7 Just so, I tell you, there will be more joy in heaven over one sinner who repents than over ninety-nine righteous persons who need no repentance.” Because we can’t have it our way, we act as if God is the enemy. We live in a “gotcha” culture. It’s not about what you do, the great ways you serve, the things you accomplish. There are people out there who genuinely think they are serving by waiting in the weeds in order to “gotcha” on the most trivial issues and show what a truly horrible person you are. The world tries to project that mind-set on to God. Nothing can be further from the truth. The “gotcha” God wants is the times when you realize your sin, repent and mourn in ashes over your sin and realize all that He has done to save you and give you eternal life. Is there any doubt in your mind that the Father, on His throne, will be smiling when you realize what has been done for you? Sure He knows who He has saved, but in the middle of the joy of heaven, there will be the Father’s smile of satisfaction, that His plan in that person has come to pass? In the parable of the talents Jesus tells us how our Master, God, “Enter into the joy of your master.” (Luke 25: 21, 23) The world tries to convince us it’s an “us against Him”. By the same token, He isn’t playing. You want to take the wide road into the wide gate, do it your way? You can’t expect God to be pleased with your destructive behavior. He wants to save you, Jesus came in order to be the salvation of the world. The Godhead knows that most of the world faces destruction, death, the eternal wrath of God, and why shouldn’t they who have rejected God? God takes no pleasure over the death of the wicked, but they made their choice and rejected God. Ezekiel writes: “Again, though I say to the wicked, ‘You shall surely die’, yet if he turns from his sin and does what is just and right,…he shall surely live; he shall not die.” (Ez 33: 14, 15). Through the Holy Spirit, the Father has made the path to salvation quite obvious and doesn’t make us jump through hoops to be in Him, as all other beliefs do. He gives us pure, unqualified grace in His Son Jesus. Jesus did the hard work and the heavy lifting. Jesus died on the Cross the perfect sacrifice for the sins of the entire world. God made the road to salvation quite obvious in His Son’s life, death and resurrection. There is nothing we can do to earn it, to justify it, to deserve it, it is given to us to have life and life more abundant. In our Gospel reading people are asking Jesus if the people who died because of Pilate or an accident somehow deserved such violent deaths because they were bad people. The people asking were somehow “good” and those that died got what they deserved. 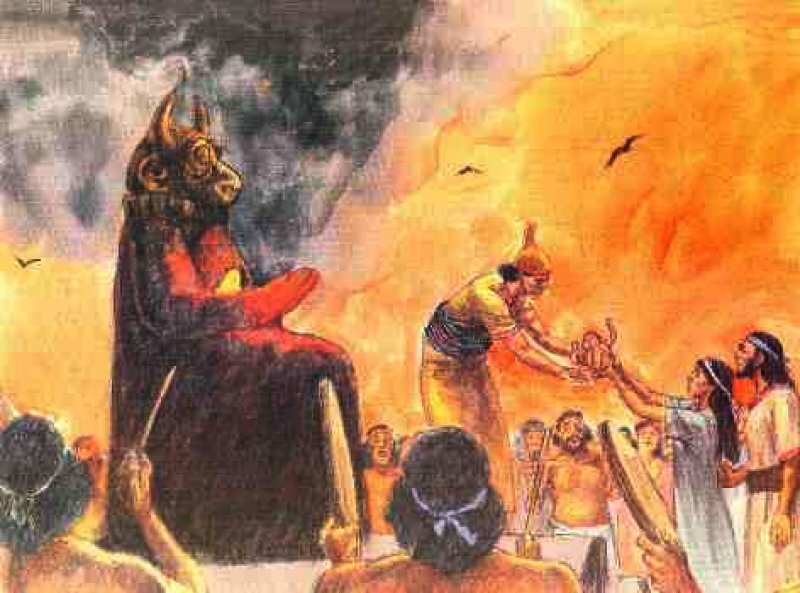 Jesus replied: “No, I tell you; unless you repent, you will all likewise perish.” Not that a tower will fall on all of them, but Jesus was saying, keep doing what you’re doing and you will all die in your sins, you will be condemned to the eternal fire where there is weeping and gnashing of teeth. We do not have a “gotcha” God who is just waiting to condemn us. John 3:16 for God so loved the world that He gave us His Son to give us a sure and certain way to salvation, everlasting, perfect life in the resurrection. Trust in Him who does so much for us, turn and repent and know that in Him, in His church, in our baptism in Him and in the Lord’s Supper when we eat His Body and Blood, in Jesus’ life and sacrificial death, He has saved you to that eternal life in the resurrection. He wants what is best for you and waits to give it to you. There is no joy in the death of a sinner, there is joy in the man and woman who repents and receives the free gift of grace in Jesus. This entry was posted in Lutheran Christianity, Sermons, Uncategorized and tagged Bible, Christian, Christian Church, Church, discipleship, Ezekiel 33: 7-20, faith, God the Holy Spirit, God-the-Father, Gospel, hope, Hope in Christ, Israel, Jesus God the Son, Joy in Christ, Lent, life more abundant, Promise of the Gospel, rebellion against God, repentance, sin, Turn from evil, worship on March 4, 2016 by Pastor Jim Driskell, Lutheran Church. In his book Walking The Bible, (published 2001 by William Morrow) Bruce Feiler writes about taking a trip, by various modes, through the lands of the Pentateuch (first five books of the Bible). These books describe Moses’ journey through , essentially, the Sinai, Jordan and Israel. Over 400 pages of Feiler going to some of the most challenging sites described in the Bible; walking, all terrain vehicles, jeeps, camel, donkey. It is definitely an interesting read, in which he also includes a lot of the contemporary political situation in the area. As much as I can remember Feiler doesn’t write about any of his personal religious beliefs. Furthermore he regularly contributes to National Public Radio’s “All Things Considered” and also writes for the New York Times, Conde Nast and Gourmet. None of which makes one think of “Christianity Today”, in other words, if he is a Christian or Jewish, he doesn’t make it apparent in 400+ pages. There is doubt, there are questions, reservations, disagreements, but through it all he interacts with Arabs, Bedouins, Christians all of various stripes and he seems to maintain a respect even admiration for vastly different people. He seems to maintain a good level of professional objectivity (which is becoming very rare in this day and age), and let’s the facts and guidance of various people take him where it seems most reasonable to go. So yes, overall, definitely a worthwhile read. “Though my friend quickly regretted his remark, he actually made a significant point. Easily the most impressive thing I learned during my trip was that the Bible’s ability to be relevant to contemporary life was by no means guaranteed. If anything, over the last two hundred years it has undergone the most concentrated and ruthless academic scrutiny that any written book has ever faced. This scientific interrogation, from every conceivable corner – archaeology, history, physics, metaphysics, linguistics, anthropology – was designed, in many cases to undermine the Bible, to destroy its credibility. But in every case (at least the ones involving historical events, after the primeval stories of Creation), the Bible not only withstood the inquisition but came out stronger, with its integrity intact, and its nuances more on display. The doesn’t mean that the stories are true, but it does mean that they’re true to their era. The bible lives today not because it’s untouchable but precisely because it has been touched – it has been challenged – and it remains undefeated.” ( Bruce Feiler Walking The Bible pp 408-9, 2001). The Bible, Jesus, have been the most highly scrutinized book and person in history, by far. Does kind of make you wonder why this agenda to so relentlessly and aggressively try to undermine the Bible. If, as most sceptics like to point out, the Bible is a book of fables and myths, why is there this zealous need to take it down. And then ironically, not weaken it, but strengthen the Bible’s scholarly authenticity, in addition to the fact that it is the inspired word of God. So it does stand to reason the more God’s word is scrutinized, the more it would validated, whether that was the intent of the scrutinizer or not. This entry was posted in Bible, Christian discipleship and tagged Abraham and Sarah, Bible, Biblical History, Biblical integrity, Biblical validity, Bruce Feiler, Church, Israel, Moses, Walking The Bible on September 22, 2015 by Pastor Jim Driskell, Lutheran Church. 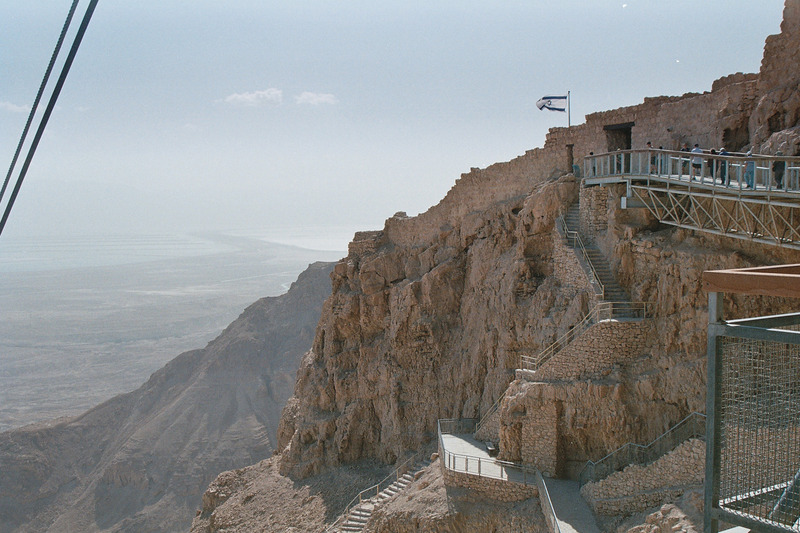 The featured picture is looking down from the top of Masada, in Israel, in the Negev desert. The fortress was built by Herod the Great. Herod earned “The Great”, because of his many impressive structures that he built in many places in Israel. 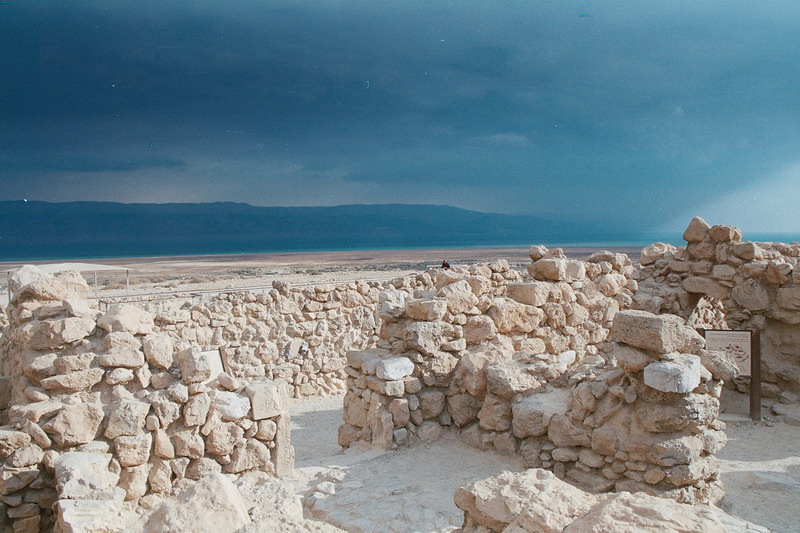 Masada was intended by him as a place of refuge, but ended up being used by Zealots holding out against the Roman army. The feature right in the center, that looks like a ramp? Well it’s because it is a ramp. 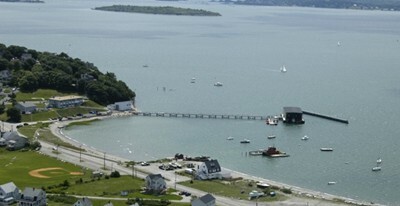 The Romans built this ramp in order to get access to the fortress. Which they finally did, only to find that all the defenders had committed suicide. It is staggering to imagine how day after day the Romans are building this ramp, right under the view of the defenders. Equally staggering on the part of the defenders, knowing that day by day their doom was right below them. 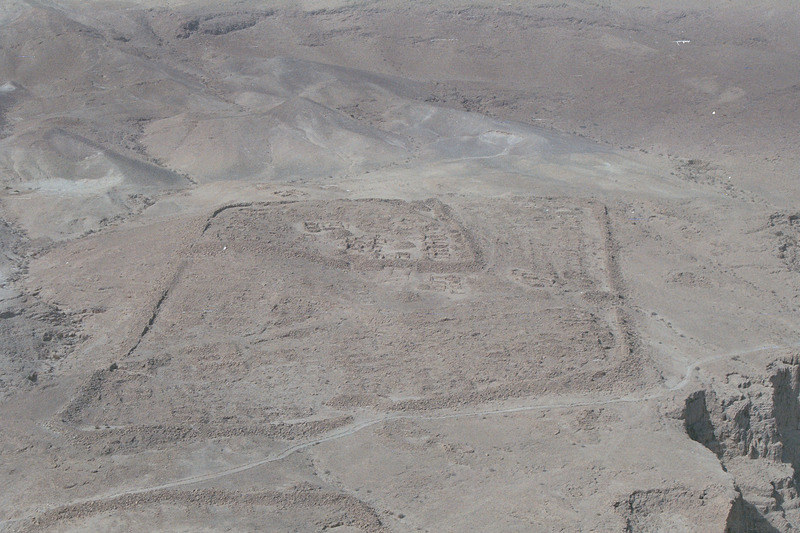 The square outlines are where the Roman Army encampments were while they conducted the siege of Masada. 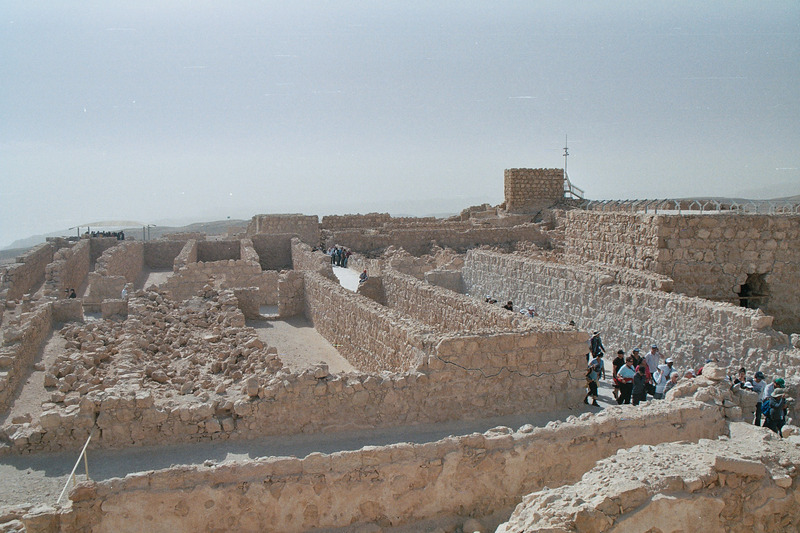 This is a picture of the interior of Masada, at the top of the mountain. 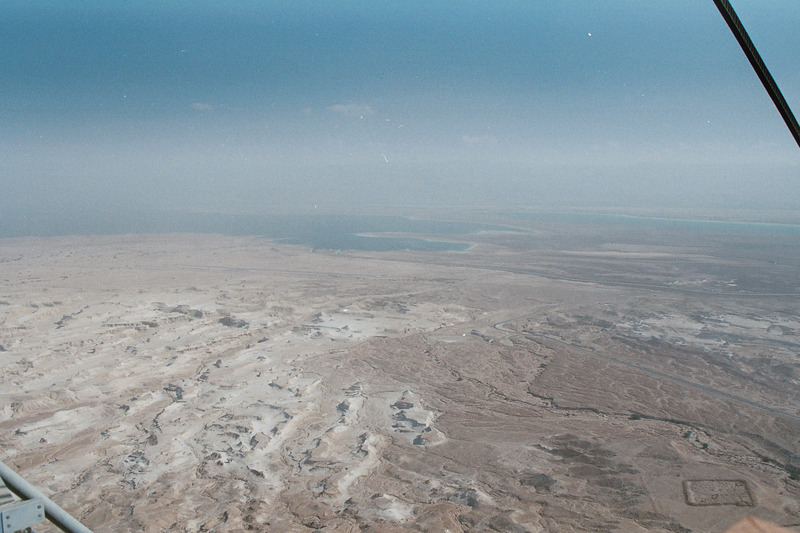 The Negev desert from the top of Masada, in the direction of the Dead Sea. A storm building over the Negev and I believe, that this is in the direction of Egypt. While we were there a factory was blown up by a missile fired from the Gaza strip. We could see the smoke, and there were a lot of military aircraft overhead while we were in the area. I really have a lot of respect for the country and the people of Israel. I still stay in contact with a few people there. They live under tough conditions and I thought this was an inspiring picture, a reminder of those who defended this fortress and their 21st century descendants who defend their tiny country. This entry was posted in History/Apologetics and tagged fortress, Hadrian, Herod the Great, Israel, Jews, Roman legions, Rome, Zealots on January 25, 2015 by Pastor Jim Driskell, Lutheran Church.